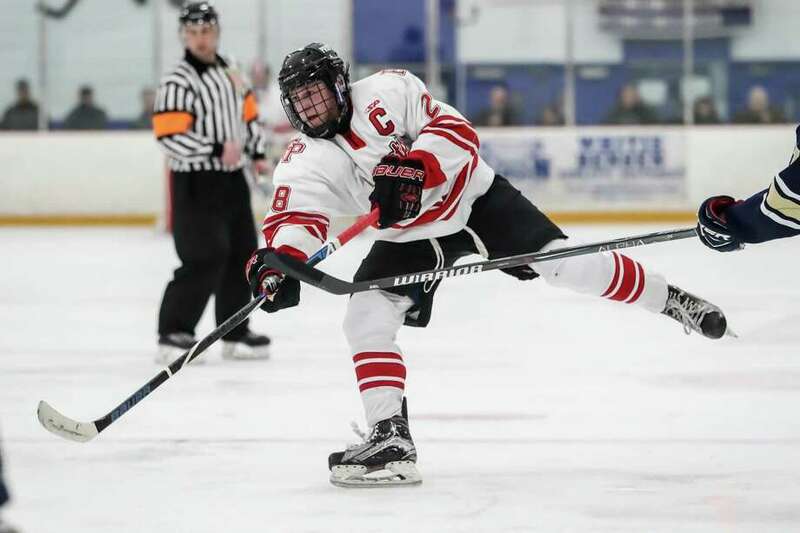 Connor Boyle (28) of Fairfield Prep takes a shot on net during a game between Fairfield Prep Boys Varsity Ice Hockey and Notre Dame - Fairfield Boys Varsity Ice Hockey on March 9, 2019 at Bennett Ice Rink in West Have, CT.
ROCKY HILL — It was one of those perfect days, from the result to the way Fairfield Prep’s hockey team achieved it, from the confidence that day built to the gregarious bus driver who kept them loose, cheering in the stands at Wesleyan. That Wednesday, Jan. 23, in Middletown was a turning point for the Jesuits on the way to Tuesday night’s CIAC Division I boys hockey final at Ingalls Rink. They beat Xavier 3-1 on senior Jake Walker’s 34 saves. “Their record was what it was at that time (3-8). Ours (3-6) was not that much better,” Jesuits coach Matt Sather said Thursday at the CIAC’s media day. “But you could tell those were two teams that were a lot better than their record was saying. Calyb Reeves, who’s on the left side of that top line with fellow seniors Chandler DuMont and Colin Bella, felt it, too. The Jesuits are 11-3-1 since that day, including a 5-2 win over Xavier this past Wednesday in the state semifinals to secure a meeting with rival Notre Dame-West Haven (13-9-1) in the championship game. They’ve done it with their trademark depth, though it took a while to develop after most of the key players from last year’s state-champion team graduated. Walker has been their rock in net, developing his own game in his first year as a starter. Four lines and four defense pairs play. They’ve reached a point where they’re confident that any line can contribute, whether offensively or defensively, on any given shift. “You’re not — and I (also) feel this way watching Notre Dame play — you’re not waiting for that first line to get back on the ice,” Sather said. This has been a group open to growth from the start, Sather said. The new and young players recognized that they had to get better, and they’ve worked toward it. The Jesuits and Green Knights split their two regular-season meetings, each winning a close one at home.